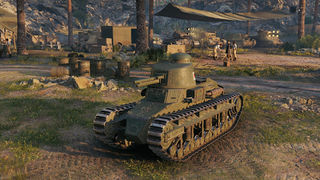 The Renault Otsu is a Japanese tier 1 light tank. Developed from 1925 through 1928 in France as an upgraded modification of the Renault FT. The modernization project was finished and the vehicle saw mass production. 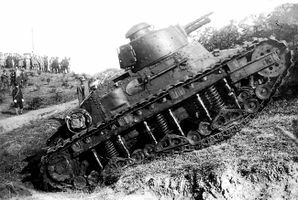 In 1929, a total of 10 vehicles were purchased by Japan and were designated the Otsu-Gata Sensha (Tank B Model). 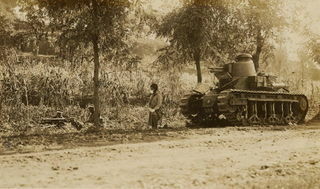 The Japanese vehicles were slightly modernized and were widely used both in action and for training purposes. Combining aspects of its French roots and Japanese deployment, the Otsu is something of a hybrid. combining the very French-like mobility, armor and aesthetics with the relatively weak turret and great gun depression of the other Japanese tanks. 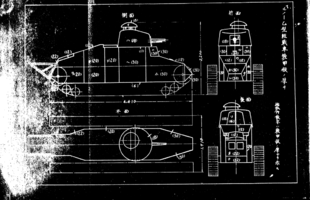 The Renault Otsu leads to the Type 95 Ha-Go, the Chi-Ni, and the Type 89 I-Go/Chi-Ro. Best Frontal and side armour (30 mm, sloped) in tier. Choice between an autocannon (low pen) or gun (higher pen) with decent damage per shot, reload but bad accuracy and aim time. Amazing gun depression - best in game! In team battle format rarely used as a counter to T1 cunningham's hispano autocannon. Depending on choice of gun, poor pen (autocannon) or bad gun handling (37mm). Large weak spot - driver's hatch on front of tank - armor thin and unangled. Turret is far less armored than the hull. 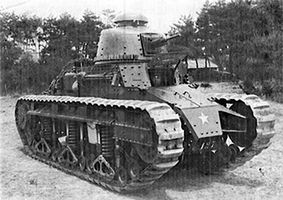 The Renault Otsu is the Japanese version of the Renault FT French light tank. 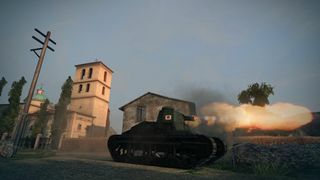 As such, the Otsu shares the Renault FT series' sluggish top speed. This makes the Otsu slower to react to changing battlefield conditions. However, it is surprisingly nimble and easy to turn, owing to its 36 degree traverse speed fully upgraded. The tank also boasts quite a lot of armour for a tier 1 tank, with 30 mm of armour at the front. This allows you to bounce quite a number of enemy tank's guns. 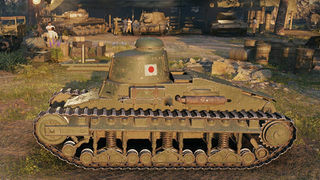 Do not fool yourself into thinking that the Otsu can bounce everything, as most single-shot cannons can penetrate this armour, but machine guns and autocannons can struggle against the 30mm plate. The selection of guns on the Otsu is pretty sub-par, all have mediocre penetration. 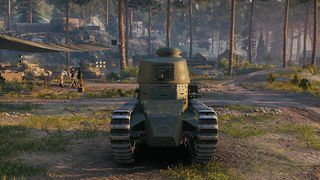 Its stock 37mm provides less penetration than most other single-shot tier 1 cannons, while the 23mm of penetration on its Machine Gun can leave it vulnerable at medium ranges and might bounce off enemies at closer ranges. Overall, the Renault Otsu performs well as a brawler in close-combat cities, but is not very good at anything else. Himmelsdorf is the best possible map for this vehicle. The penetration on both guns is really only suitable for close-range engagements, where the 0.5 /100 m accuracy does not matter much either. Use the terrain for cover while you reload, and punish enemy tanks that try to take you out. The tank suffers a lot when facing tier II tanks due to lacking pen / accuracy. In tier II the armor also loses a lot of its value. Due to low top speed, flanking is harder to achieve. Please note the Map Restrictions for tier 1 tanks and the Camouflage Type for those maps when purchasing a camouflage skin/paint job for this tank. The 13mm Machine Gun is the only module available for research, so get it. Louis Renault had obtained an order in 1923 to build two new prototypes as a parallel modification project, with the factory designation Renault NC; it was intended to feature not only an improved suspension system but also a stronger engine. Like "FT", "NC" is a combination of code letters devoid of any meaning. One prototype happened to be finished second, in December 1925, and was therefore called the NC2. It was fitted with a modified Kégresse leaf spring suspension and a 62 hp engine. It had as an alternative designation Renault Modèle 24/25, because Renault proposed to build it as a possible "fast tank" as specified in Plan 1924 of the French Cavalry. This line of development was discontinued however. The first prototype to be ready, thus named the NC1, had a different suspension system, with twelve wheels and three large vertical volute springs per side. It allowed for a top speed of 18.5 km/h, making it in 1926 the fastest French tank ever developed. Renault also tried to open foreign markets. In 1929 he obtained an order of ten vehicles for Japan, there called the Renault Otsu-Gata ("Type B"). These tanks were modified in Japanese service, fitted with thicker armor including 30mm frontal armor plating, the 37mm Type 11 Sogekiho Infantry Gun, and 75 horsepower Mitsubishi diesel engine.